AMS-26 is the first automatic oil type bar feeder with multi-spindle in Japan designed for multi-spindle lathes. Servo motor is adopted for feeding device and there is no need for temperature control because it is not operated hydraulically. 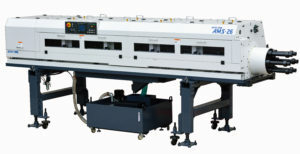 AMS-26 is perfectly connected with multi-spindle lathes. Installation work is easier since caster wheels are equipped as standard accessories. You can perform maintenance on a lathe without any trouble since the main unit can be moved 700mm backward. Materials will be picked from the rack by the lifter and loaded into the support. You can easily adjust the material diameter with one handle.